Summer makes me happy :) except for the hot, hot, hot weather. But for the most part, I like summer. This summer has been fast and furious. One of the unique experiences one has in the panhandle of Texas or in the midwest for the most part, is intense thunderstorms. We have been experiencing rain almost every evening for the past 5 days. It helps to cool things off and makes our farmers really happy. You know you live in a farm community if the congregation is praying for rain!!! We experienced a real big storm last week. My DH and DS had to pull the mattresses into the hallway and clear everything out and we stayed there for about 1 hour while we waited for the storm to pass. There was a tornado on the ground a few miles east of town, but luckily did not stay down. But alas, my car sustained some severe damage, broken windshield, large (baseball size) hail, etc. It is now in the shop for a new roof, quarterpanels, paint, windshield and who knows what else. We also are having our roof and the rest of the property reviewed this week, to see if we might need some roof repair/replacement, air conditioner check, etc. I am more worried about our air/heat system. It is a rooftop industrial strength Lennox unit and I would rather put in a homeowner's claim now for repair replacement than have something materialize in a few months. So far, it has been a busy and full summer. 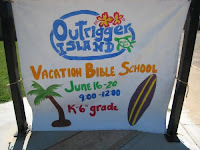 I was pleasantly surprised to end up being in charge of the arts and crafts room for our church's VBS session last week. My teenage DS was recruited as my #1 helper (token slave). Plus, I was fortunate to end up with three additional women who jumped in to help at the last minute. My DS was gracious to decorate the room and also put in about 12 additional hours that week in the evenings, plus 4 each day. 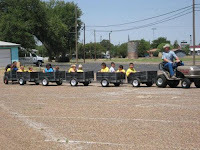 My toddler son also had a blast and got to spend some quality time with his buddies from church. 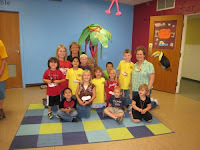 We provided VBS for PreK-6th grade and had a different craft for each day for all age ranges. It was a hectic week, but worth all of the hours. 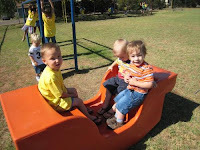 DS in the orange striped shirt, cute as a button!!! 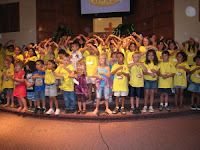 The massive group of kids participating in VBS 2008. Just some extra fun for everyone on Friday.